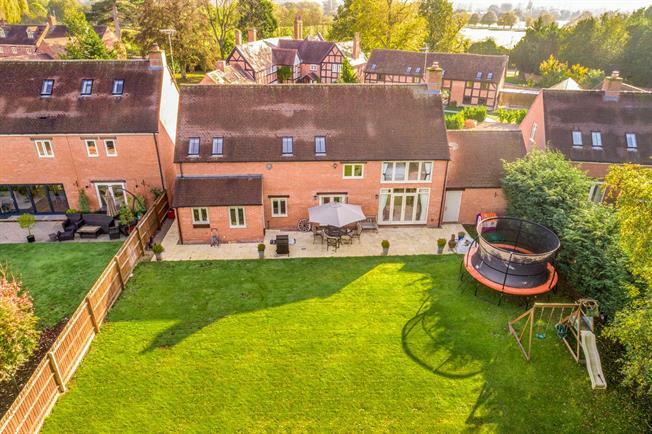 4 Bedroom Detached House For Sale in Warwick for Guide Price £695,000. A truly stunning detached four bedroom executive home set in a private gated community located close to Warwick town centre, boasting spacious living accommodation, modern features throughout and large private garden to the rear the property briefly comprises; entrance hallway, living room, dining room, snug, WC, open plan kitchen dining room, utility room, four bedrooms with en-suite to the master, grand upstairs landing, family bathroom, double garage, large drive to the front and private garden to the rear. Bright and airy grand entrance hallway with under stairs storage, wooden flooring and ceiling lights. Double glazed uPVC windows and uPVC front door opening onto the front overlooking the driveway. Feature wood burner with stone mantle surround and hearth. Double glazed uPVC window facing the front and uPVC French doors opening to the rear opening onto the garden. Ceiling lights. Spacious multi functional reception room which is currently used as a playroom. Double glazed uPVC window looking out onto the garden. Ceiling Lights. A range of built in wall and base units and central island with granite work surfaces over. Inset sink with mixer tap, integrated, fridge/freezer, dishwasher, microwave, cooker and four ring gas hob with extractor overhead. Tiled flooring. Double glazed uPVC window and uPVC door opening onto the garden. Spotlights. Wall and base units with granite work surfaces over, space for washer dryer. Tiled flooring and spotlights. Double glazed uPVC window facing the rear overlooking the garden. Tiled flooring and spotlights. Low level WC, wash basin and tiled flooring. Double glazed uPVC window with frosted glass. A generously spacious and light landing with access to the loft, four bedrooms, family bathroom and airing cupboard. Ceiling lights. A spacious double bedroom with built in wardrobes and en-suite. The room offers a large double glazed window overlooking the garden. Ceiling light. Low level WC, pedestal sink and single enclosed shower with wall mounted controls. Tiled flooring and part tiled walls. Double bedroom with built in wardrobes and two Velux windows. Wooden flooring and spotlights. Double bedroom with Velux window and double glazed uPVC window facing the front of the property. Ceiling light. White three piece suite with low level wc, panelled path with shower over and pedestal sink with mixer tap. Tild walls and flooring. Spotlights. Double bedroom with build in wardrobe/storage cupboard. Velux window and double glazed uPVC window facing the rear overlooking the garden. Double garage with two single electric up and over doors, lighting and door to the garden. Large gravelled driveway offering ample parking with access to the double garage. Private rear garden mainly laid to lawn with patio area to the front, fenced to three sides. Offering access to the back of the double garage and to the front of the house.